Why is Vauxhall being sold to Peugeot's owner? Vauxhall and Opel are being sold to the company that owns Peugeot and Citroen for 2.2bn euros (£1.9bn). We look at the logic behind the deal. Why is General Motors' European business up for sale? In a word - profit. Or more accurately as far as GM Europe is concerned, 18 years of losses. The last time the US carmaker's European business, which houses Germany's Opel and the UK's Vauxhall, made a profit was in 1999. Although the division's boss, Karl-Thomas Neumann, pledged to return to growth in 2016, the operation ended up reporting a loss of $300m (£245m). Both Vauxhall and Opel have been part of General Motors for nearly 100 years. GM bought UK business Vauxhall in 1925 for $2.5m. It acquired a majority stake in Germany's Opel in 1929 and bought the remaining shares in 1931. Both brands' share of the European market has been shrinking for some time. In 1990, they held a combined 11.5%, but by 2016 this had fallen to 6.5%, according to carsalesbase.com. Why does France's PSA want Vauxhall and Opel? In 2012, PSA was close to collapse. Under boss Carlos Tavares it has been revitalised, and the GM Europe deal will allow him to overtake his previous employer, Renault, to become Europe's second largest carmaker. The takeover will give PSA access to the UK market where demand for its Peugeot and Citroen cars has been poor in the past. Most importantly, Mr Tavares has already said he wants to go back to the US, which Citroen left in 1974 and Peugeot exited in 1991. It is now more likely that PSA will use Opel to make the push into the US using the "halo effect" of German carmakers. However, it is not clear how PSA will navigate US President Donald Trump who has threatened German manufacturers with an import tax of 35%. What is the difference between Vauxhall and Opel? Since the early 1980s, Vauxhall cars have been more or less identical to Opel but just branded differently. A large number of Vauxhall vehicles sold in the UK are made in Opel's German, Spanish and Polish factories and given the British brand. 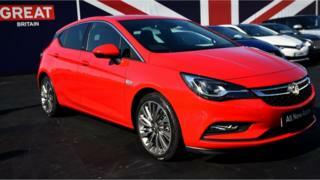 Whereas a high proportion of models made in Britain are exported overseas and rebadged as Opel. GM has kept Vauxhall in Britain "because it is woven into the fabric of British motoring history," says a company spokesman, who points out that it is the country's oldest surviving carmaker. It built its first car in 1903 and continued to make vehicles throughout both world wars. What does the deal mean for jobs? GM Europe employs more than 38,000 people. Of these, 4,500 are at Vauxhall's plants in Ellesmere Port and Luton in the UK and the rest spread across Germany, Poland, Hungary, Austria, Spain and Italy. On top of that, Matthias Holweg, scientific adviser to the Automotive Council, says that every car plant job supports about seven and a half jobs in the wider supply chain. Reports suggest PSA Group will guarantee the production of the Vauxhall Astra at Ellesmere Port, which is due to run until 2021, and the Vivaro van in Luton, which is expected to be made until 2025. Following these production runs, however, there has been no comment on the medium- and long-term future of the plants. What now for the future of the UK car industry? While Europe will gain a new carmaking giant - PSA will be second only to Volkswagen - the future is much less certain for the UK. Cars sales have been robust in the UK. According to figures from the Society of Motor Manufacturers and Traders, new car registrations rose by 1.8% to 257,679 in the year to February, following record growth in 2016. Despite this, Vauxhall could feel the brunt of cost reductions under its new owner. It is cheaper to cut jobs in Britain, according to Prof John Colley from Warwick Business School, who says redundancy costs are three times more expensive in Germany. Last week, it emerged that Ford could cut more than 1,000 jobs at its Bridgend plant in Wales. And while Prime Minister Theresa May intervened to ensure that Nissan will build new Qashqai and X-trail models at its plant in Sunderland, Koji Tsuruoka, Japan's ambassador in London, has warned that car companies could leave if post-Brexit tariffs hit profitability. In Europe, vehicle registrations rose by 6.5% to 15.1 million vehicles last year, according to European Automobile Manufacturers' Association, which is the highest level since a peak in 2007. However, the association predicts growth will slow to 1% this year, with elections in Germany, France and the Netherlands adding to uncertainty.